i suppose i should thank the airlines for imposing ever-stingier weight restrictions on international luggage, because being forced to edit my bags down to 4 for the year has been a worthy exercise in the economy of style. this post is a little long as it's a set of mini reviews for each of the ones i packed and have used a ton since i got here. the Longchamp pliage tote is an old classic that is an absolute necessity; i used my first one (in navy) almost all the time for work for two and a half years and ended up giving it (still in excellent condition) to my mom after i thought i got tired of the style. no luck in finding an alternative! so, earlier this year, i bought this one in grey and have been using it nearly everyday as my default work/errands/bad-weather bag. the straps are long enough to make schlepping comfortable, and the best part is the full top zip: perfect for keeping everything secure and safe from pickpocketers (a constant concern here). among its other virtues is that, even though it's a fancy imported label here in Shanghai, Longchamp is just luxe enough to be well made and classic but still low-key enough to not scream 'status bag!' to strangers or your co-workers. at $145, i think this is why college students in Europe and the US use this as their bag of choice as the anti-bookbag bookbag, and why you could also use yours as the perfectly utilitarian day/work bag in These Recessionary Times. Baggus have been super handy from day one. almost every grocery store or large mart (ie: Carrefour) charges extra for plastic bags, so it's indispensable to have at least one of my baggus with me at all times. i've plunked everything from books to random apartment objects to a week's worth of vegetables in my baggus, and everything always fits. the bright colors and fun prints are an added bonus to make errands and grocery-shopping that much more cheerful. i just washed all of my baggus in my washing machine and they dried on the clothesline in no time. if you don't have baggus yet, get some! they're truly wonderful and also a great gift idea. i also really like having a couple of zip pouches in different sizes to keep small odds and ends organized. i got a wonderful little three-compartment zip pouchette last year from Sammy Ethiopia, and it is made out of wonderfully buttery leather, perfect for keeping things tidy. the vintage Coach saddle bag has been through many a rainstorm with me and miraculously any rain spots have always dried clean away. one of my vintage favorites and it is incredibly well made. the crossbody strap makes it really handy as a weekend, shopping, and touristing bag. i've seen the Hulme bags at Barney's, and they've got some nice tweaked details (like a few more compartments on the inside and some pen slots) that make it even more user-friendly. the leather on the JW Hulme legacy is nice and thick, a bit more rugged than my vintage Coach. the Hulme ones feel a bit stiff, but i think it will break in and soften wonderfully with use. finally, the Balenciaga classic city bag is really an ideal luxe bag for travel. it's lightweight and still low-key, functional (again, top zip closure and the little front zip pouch for your phone), and adds just enough edge to whatever you're wearing. yes this bag has been seen on every celebrity since it came out, and yes it was trendy as hell a few years ago and still has some iffy connotations if you're pairing a bubble-gum colored city with a juicy couture tracksuit. but the classic city in the classic neutrals (black, anthracite) has been around for over 10 years now...and the design just really works. i am a firm believer in wearing stuff that you like and that works for you, regardless of how coveted (or not) it is. anyway, i hope this is helpful for anyone who is curious about any of the above styles, or who is trying to edit her suitcase for an upcoming trip! do you have a favorite bag(s) that you never travel without? I like the grey color in the Pliage tote. This is my go-to travel bag. This was very interesting! 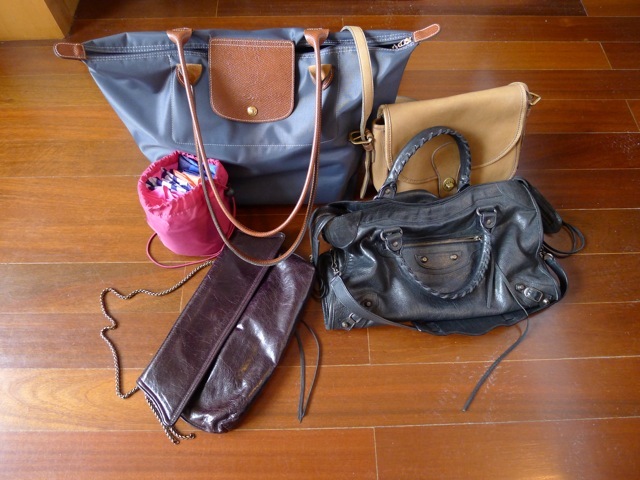 I'm not much of a bag girl - I have one for each occasion, to be replaced rather than added to. I use a Cambridge leather satchel for work and school, a chocolate leather saddlebag from Morocco for daily use, and a large zipped leather pouch from a local leatherworker for going out (I have several in different colours and finishes; they're cheap and beautiful quality. I think they're meant to be pencil cases). I also usually have a battered tote bag on the go for shopping or the piles of books and folders I need for work; my current is a green one I got free from Tate gallery in London. I wish I was more of a bag girl, since they do finish an outfit wonderfully, but I can never justify the spend. Travel bags . . . A favorite subject for those of us with wanderlust. My perfect travel bag for many years was the Coach XL duffle/bucket bag. I've gone off her in the past year, but I have her tucked away if I change my mind. I'm also a fan of the satchel, as it's easy for pulling out photography equipment. @Prêt à Porter P i think i like the grey Longchamp - it's such a multi-dimensional shade. i totally dig all the zippers and compartments in that KC bag. that's definitely one of the key attributes of a great travel bag! I have 3 Longchamp LePliage bags (purple, black, and a limited edition one from Les Galeries Lafayette) that I use for work/travel. I always bring an extra one in my luggage to fit in extra stuff since they fold up so well. These are the bags that I'd pack too - the Longchamp Pliage and Balenciaga City are two of my most versatile bags and I always pack them! I LOVE baggu bags. I held out for a long time, thinking that I could/should just use all the free canvas tote bags I've acquired over the years for groceries. But, the baggus are just so much better because they fold up and are so lightweight. The Le Pliage is an absolute must. They're my go-to sightseeing bag because they're roomy, lightweight, water-resistant and so easy to clean. I've worn my dark purple one to death and it's still in good shape. In general, I think a good travel bag has to have a shoulder-carrying option. Sometimes you just need both your hands. And a zipper/flap to deter pickpockets is a must. Open totes make you a target. By the way, how's the wear on your Balenciaga? I've been hearing about how easy the leather scuffs, especially on the bottom corners of the bags. Do you find that to be true, Ms. Sophie? @alison*elle so true - the fact that my longchamp folds up into a neat little square that weighs nothing is a huge plus. @dontaskmetosmile first off, i LOVE your username! lol. agreed with you on all the points regarding good travel bags. the pliage bags do break in nicely too. my balenciaga seems to be rather wear-resistant, but i also picked a black leather one for that reason as i didn't want to deal with color transfer issues. the corners on mine are slightly worn but not at all scuffed in a noticeable way. i applied a little bit of leather conditioner to freshen up the bag and that seems to add a nice bit of protection. also, i've heard the leather on balenciaga citys have gotten better and more durable in the past few seasons, not as delicate as before when many people were complaining about them! Thanks! And thanks for the reply. Yes, the Le Pliages do get less rigid over time. The Balenciaga City has always been an option for me. I think, despite its "Hollywood It Girl" connotations, it's a classic but edgy handbag. It's the wear that worries me about it though. Apart from the feedback I read online, the leather they use seems so delicate when I go an take one for a test run in the store. So I've always been on the fence. I love yours in particular, though. Black with regular sized-hardware. I have a Le Pliage for rainy days and when I have a lot to carry to work, but it's not my ideal as I don't like the fact that it has no extra pockets for organization. The small one on the inside is useless. Even if I put my keys in there for easy access, they are bound to fall out. For more elegant everyday/work bag I have the Longchamp Legende in black patent leather and I love it. It has structure, which I love, because it won't flop over when I open it and try to find something inside. Plus, it is big and has lots of pickets for organization. Right now, it's my favourite bag for everyday! @Anonymous hey Nancy :) thanks for stopping by! i like to use my muji purse organizer to keep important things from getting lost in a big bag like the Longchamp that doesn't have organizational compartments. also, your comment reminded me that i like to use zip pouches to keep everything organized when i'm traveling and for everyday. it also makes switching out bags so much easier! Great collection! I never travel without my Jerome Dreyfuss Billy bag! I really need to get a baggu, I have to look up if they ship overseas, I've never seen them here. I've been carrying only the LV Monogram Vernis, but now that I walk to work, am thinking of a Prada backpack:). Classics become classics for good reason, and it takes a level head to recognize that you can carry a classic long past its day in the sun. Alittle off topic (sorry! ): I still think about your exquisite Kelly and I bet she misses you. I was just wondering what sort of process you went through to authenticate it. I am not implying its not authentic! Its just that I've been seeing some rather un-nerving articles online lately about how good luxury replicas are getting. Do you have any info/tips on how to authenticate a Hermes? Thanks! @LPC completely agree with you. i think in spite of all the hoopla about LV and the logomania of the last decade, they make some damn good bags. do you find your LV bag to be low maintenance? i imagine the patent leather to be nicely weatherproof. anyway, yes authenticating luxury bags are a major pain. i did a ton of research and homework on my own before buying mine, so i tried to build up a massive knowledge base about details and all the aspects of the H kelly on my own. i also got it authenticated twice by veritable H experts on the Purse Forum, who run some damn impressive discussion threads on all the real and fake H on the vintage/resale market today. finally, bringing it to your H boutique to have the leather reconditioned would be the last and final step. the craftsman on site would tell you for sure if there is a problem. Sadly, I've been landlocked as of late, but the last time I took a mini weekend trip, I brought along a messenger bag by Alexander Wang that was perfect for walking around the city. Also, I completely agree with carrying smaller zip pouches to keep everything organized! I hate rummaging around in my bag for small things like keys or lip balm, but I only just recently started keeping items like that separately in their own small bag. I'm still using a Ziploc bag (lol! ), so I definitely need to get a more durable (not to mention, cuter) alternative. I've been fighting the urge to buy the Longchamp bag for a while and I seriously thought about buying it this year! Your photo definitely puts the bag up there on my wishlist!